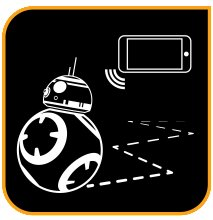 Guide your BB-8 with a smartphone or tablet within a 100ft range. Based on your interactions, BB-8 will show a range of expressions and even perk up when you give voice commands. 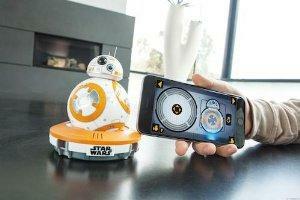 Set it to patrol and watch your Droid explore autonomously, make up your own adventure and guide BB-8 yourself. An adaptive personality that changes as you play. Based on your interactions, BB-8 will show a range of expressions and even perk up when you give voice commands. Top speed of 4.5 mph (7ft/s) and the Bluetooth Smart BLE connection has a 100 ft range. 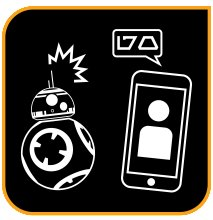 Guide your BB-8 with an IOS or Android phone or tablet. 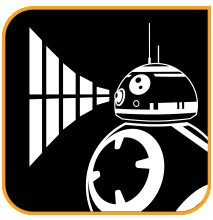 Record and view virtual holographic videos with BB-8. Set it to patrol and watch your Droid explore autonomously, make up your own adventure and guide. 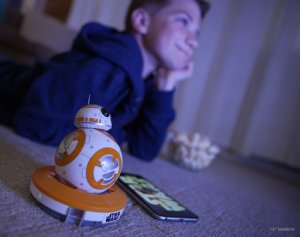 BB-8 App-Enabled Droid is powered by a Sphero app, available through iTunes or Google Play. Watch Star Wars The Force Awakens with your Droid. 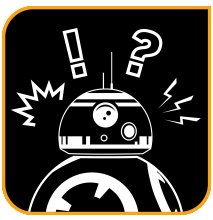 Set BB-8 in his charging base, start the movie and watch his reactions along with the film.